Rock Tin ore is one of the metals that mankind first discovered. In the early days, our ancestors’ innovative extraction of tin from its ore, used tin, copper and lead to produce bronzes. Tin and tin alloys have been widely used in modern national defense, modern industry, advanced science and technology and human life because of the ductility, stability of chemical properties, corrosion resistance and melting, small friction coefficient and non-toxic tin salt. Rock Tin ore has the characteristics of strong development, rust resistance and corrosion resistance. Rock Tin can form various alloys with other metals, is easy to be plated on many metal surfaces. In particular, the surface of tin is corrosion-resistant and nontoxic. 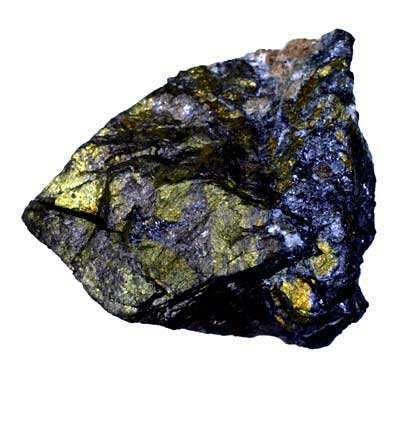 Rock Tin ore is relatively concentrated in the world, mainly in Southeast Asia, Central South America and eastern Russia, followed by eastern Africa, Western Europe and western North America. In nature, the tin ore are existing in sand or alluvial raw material, this kind tin ore called sand tin or alluvial tin, the raw material may be with stone, sand, gravel, soil, sticky clay, some times with other magnetic iron, tungsten, ilmenite, hematite, monazite, zircon sand and other minerals. The other type tin ore is hard rock tin ore, the tin is existing in hard rock, such as normal stone, quartz vein above the land. The rock tin ore is mostly like to be with tungsten ore together. How to the extraction of tin from its ore? In general, the rock tin ore processing machine of heavy selection are generally used, and the ore dressing of tin ore with a high degree of dissociation of the monomer is basically the same as the ore dressing of gold ore, and the better ore dressing index can Be obtained by simple screening. For ore processing of tin ore with low dissociation degree, it is often necessary to break the secondary structure by bar grinding and other processes, so as to improve the recovery rate and concentrate grade. The basis of the gravitational separation of sand tin ore processing machine is also the principle of gravity separation. According to the specific gravity difference between tin ore and waste stone, the proportion of tin and waste stone in the tin deposit is very good And the beneficiation effect can be obtained by the method and equipment of heavy separation in tin ore processing plant. At the same time, the advanced tin ore processing plant has the advantages of high efficiency, energy saving, environmental protection and so on, the investment of equipment is small, and the operating cost is low. It is an ideal choice for the beneficiation of Sands. The equipment for gravity separation of sand tin ore is mainly jig. 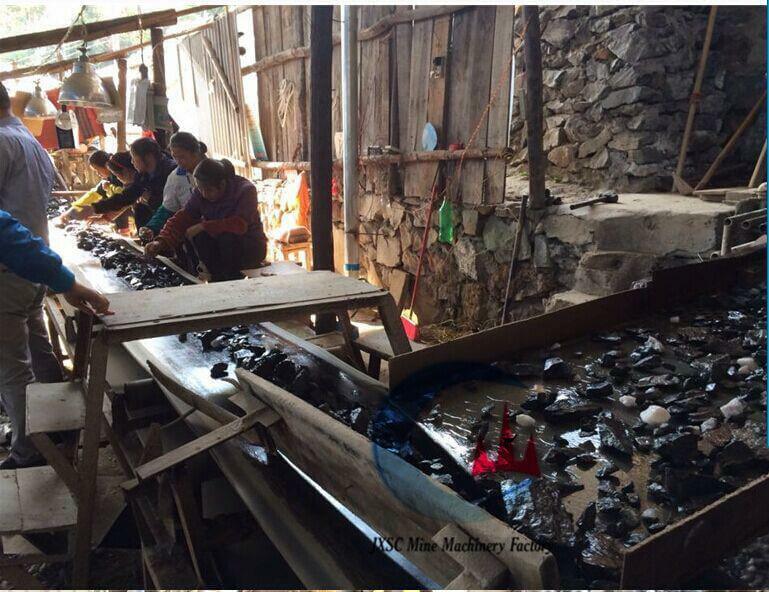 Sometimes, the rocking bed is also used to improve the recovery rate of finely grained tin ore. The technological process of gravity separation for sand tin ore is screening, jigging and dewatering. The sand tin ore with a low degree of dissociation, two reelection processes are often needed: screen jig, rod mill, jigging and dewatering. What are the extraction methods of tin from its ore? Extraction of tin from its ore generally adopts gravity separation method, which is determined by the density of tin ore than the characteristics of paragenetic minerals. However, iron oxides such as magnetite and hematite are often associated with tin ores, so gravity separation is not possible. Therefore, magnetic separation and flotation methods will be used in tin ore dressing. This step is aimed at raw materials with high mud content and strong cementation. Such raw materials must be washed and desliming before crushing. The mine washing machine is used for washing the ore, and the classifier is used for the desliming and the hydrocyclone. 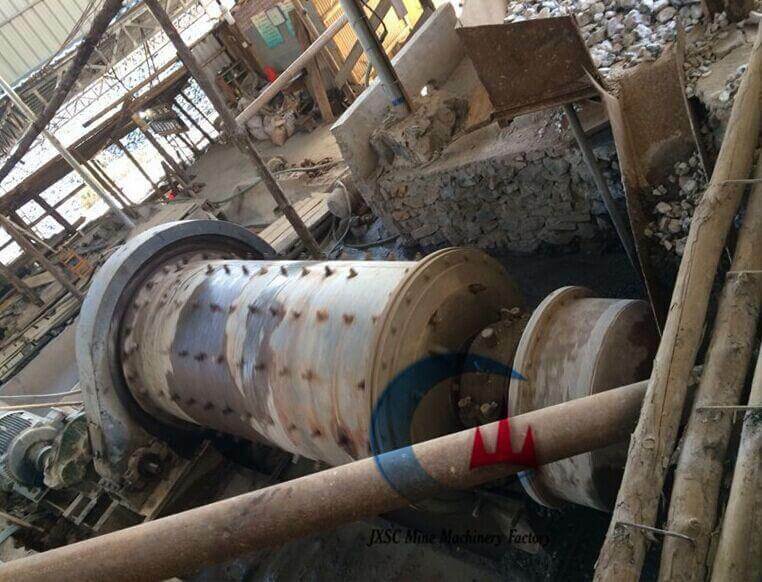 Using the jaw crusher and hammer crusher, the ore is broken into ore with a particle size below 20mm. 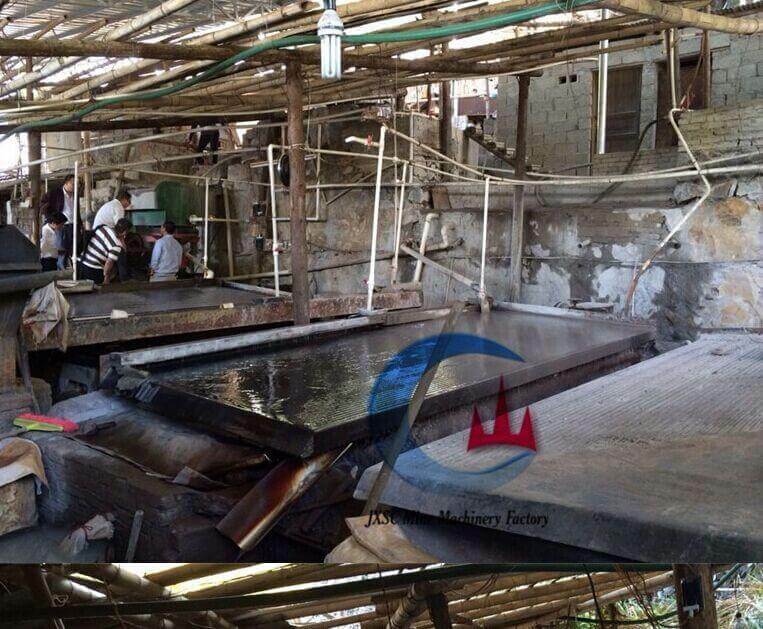 Then the vibrating screen is divided into two particle sizes, 0-4mm and 4-20mm. Rock Tin Ore Crushing: for crushing the big rock tin ore stone to a smaller size before grinding. Crushers can be rough rock tin ore jaw crusher, rock tin fine jaw crusher, rock tin cone crusher, rock tin hammer crusher, roller crusher rock, depends on the rock tin ore feeding size and process capacity to use which kind crusher. Rock Tin ore Grinding: after crushing the stone to a smaller size, need to grind to power by tin ore ball mill grinding machine or wet pan mill or other rock grinding machine, so the tin concentrate can be released out from stone. 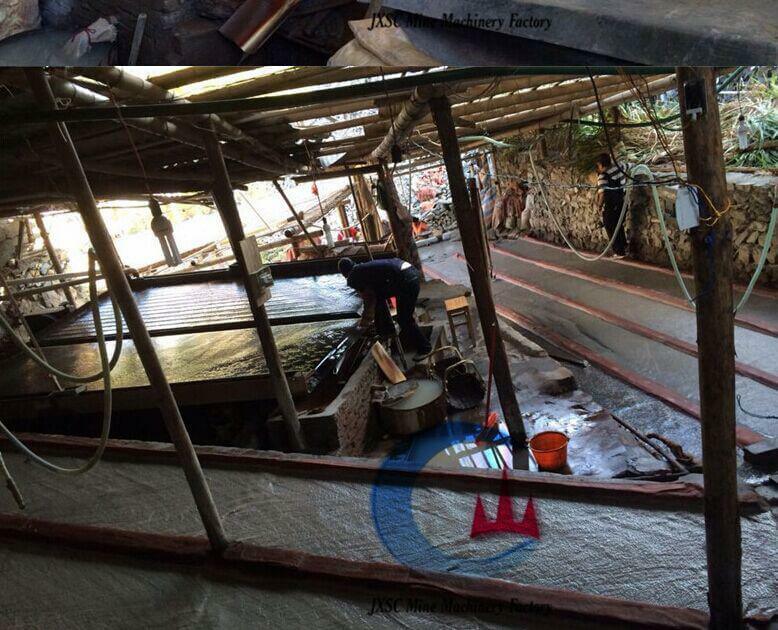 Then go to the gold separation machine and concentration machine( tin ore shaking table). After crushing and sieving, the ore of 4-20mm should be pre-processed by using heavy medium cyclone, and then into a grinding section. After grinding, jigs and vibrating screens are used for further separation. The screen is controlled at 2mm, – 2mm and then the concentrate is selected by shaking table, +2mm becomes tailings. The flotation stage is divided into two steps: mixed flotation and separation flotation. Firstly, the concentrates selected by jig and shaking tables are mixed flotation, then the concentrates are separated by lead and zinc flotation, and the tailings are separated by shaking table. Slime enters the 300mm cyclone, then overflows through 125mm and 75mm hydrocyclones to remove fine mud, and then the sediment is concentrated and desulfurized by flotation and cassiterite flotation. JXSC mine machinery Company in China has more than 30 years professional experience at Rock tin ore processing plant, design full set tin ore process flowchart, provide complete set tin ore processing plant, can send an engineer to mine site for equipment installation and commissioning guidance. Included: China, Indonesia, Peru, Brazil, Bolivia, Malaysia, Nigeria, Myanmar, Australia, Mongolia, Kenya, etc. Do research about the extraction of tin from its ore has a positive influence on the mineral mining industry.